DISNEY’S ESPN WIDE WORLD OF SPORTS COMPLEX: Located in the Walt Disney World resort, approximately 5 minutes drive from our vacation homes. The 220 acre complex has 9 venues and hosts numerous amateur and professional sporting events throughout the year. AQUATICA: Located near SeaWorld, approximately 10 minutes drive from our vacation homes. Take a plunge through a lagoon filled with dolphins or soak on a white sand beach at the most popular waterpark in Florida. Race on a river of rolling rapids or float down a lazy river through colorful fish. Rides, slides, and a double wave pool round out the adventures. TYPHOON LAGOON: Located in the Walt Disney World resort, approximately 10 minutes drive from our vacation homes. Disney’s exotic tropical swimming paradise. Body surf in one of the world’s largest wave pools or snorkel with live sharks. Laze on the beach or float down the river. Rides and slides complete the experience! BLIZZARD BEACH: Located in the Walt Disney World resort, approximately 5 minutes drive from our vacation homes. 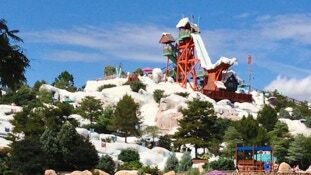 Dive into the ‘wintery’ spills, chills, and thrills, at Disney’s most exhilarating water park. Plunge down Summit Plummet, the tallest, fastest, free fall ride in the United States. 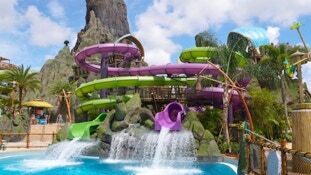 VOLCANO BAY: Located in the Universal Orlando resort, approximately 15 minutes drive from our vacation homes. The 200 ft Krakatau ’volcano’ serves as the centerpiece for this Polynesian themed water park. Winding rivers, slides, reefs, drop rides, raft rides, and more make for a spectacular day! GATORLAND: Located on Orange Blossom Trail, approximately 15 minutes drive from our vacation homes. A perennial favorite on everyone’s to do list! Gatorland is a 110 acre park and wildlife preserve combining Old Florida charm with exciting exhibits and entertainment. Family fun with thousands of alligators and crocodiles, a breeding marsh, petting zoo, and more. ICON ORLANDO: Located on International Drive, approximately 10 minutes drive from our vacation homes. Experience unbelievable views of Orlando from this 400 ft observation wheel. All 30 passenger capsules are air conditioned and can hold up to 15 people! MADAME TUSSAUDS: Located on International Drive, approximately 10 minutes drive from our vacation homes. Indulge in the ultimate fan experience. Get up close and personal with these ‘celebrities,’ they are not behind glass so you can take the ultimate selfies! SEALIFE ORLANDO: Located on International Drive, approximately 10 minutes drive from our vacation homes. Gaze in awe at breathe taking creatures as you walk through incredible themed environments and sharks and rays swim overhead in Orlando’s only 360 degree underwater tunnel.